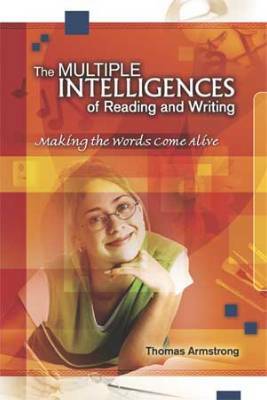 This Study Guide is designed to enhance your understanding of The Multiple Intelligences of Reading and Writing: Making the Words Come Alive, an ASCD book published in April 2003, by helping you make connections between the text and the classroom, school, or district in which you work. Written by Thomas Armstrong, this book shows how involving all eight intelligences in the process will help students acquire reading and writing skills. You can use this Study Guide before or after you have read the book or as you finish each chapter. If you have not read the book already, you may wish to scan this guide very quickly and highlight questions and instructions that are designed to prompt your thinking prior to reading the text material carefully. The study questions provided are not meant to cover all aspects of the book but, rather, to address selected ideas we thought might warrant further reflection. Most of the questions in this Study Guide are ones you can think about on your own. But you might also consider pairing with another colleague, or forming a group of people, who have read (or are reading) The Multiple Intelligences of Reading and Writing. What is the literacy rate in your community? What literacy programs are available for those who cannot read or write? Discuss your own reading habits over the course of your life. How have they changed? How have the reading programs in your school district changed over the past forty years as a result of the Reading Wars? Research suggests that acquiring literacy affects brain development. Do you think that the way in which literacy is taught can affect the way it is processed in the brain? Given the contention of this book that literacy involves all eight intelligences, is it valid any longer to classify reading and writing as linguistic activities? Examine the links between linguistic intelligence and the ability to use sign language or Braille. Using the OED or a book of etymological origins, make a list of words that have specifically physical origins. Act them out with your students as you explain their history. Observe young children engaged in emergent literacy (e.g., 'pretending' to read and write). Notice the presence of gross motor movements and other evidence of bodily-kinesthetic intelligence as part of the emerging literacy process. Create a bodily-kinesthetic/literacy activity center where students create words, sentences, and text in hands-on ways (e.g., using pipe cleaners, tooth picks, clay, collage, and other forms). Observe any changes in certain students' abilities to read, spell, or write more effectively as a result of time spent in this center. Give your students alphabet boards and, for one day, have them make all their verbal communications to each other through spelling out words on the boards (or alternatively, put the alphabet in large letters on the floor and have them spell their wants and needs by running to each subsequent letter). Explore connections between pictures and linguistic symbols in languages such as Chinese (e.g., get a book on Chinese characters that shows correspondences between certain characters and their pictorial equivalents). Have students illustrate abstract nouns (democracy, courage, safety, etc.) and talk about similarities and differences in the way that different students pictured the same concept. Action research project: create a unit where students are taught how to visualize (e.g., using a book such as Put Your Mother on the Ceiling by Richard de Mille). Notice if their ability to visualize what they read improves as a result of the practice. Develop an alphabet based on pictures that look like (and if possible, sound like) the letter shape (e.g., S = snake, M = mouth). Do a writing assignment with students where both drawing and writing are required and evaluated on equal terms. Turn-the-tables assignment: ask students to draw a picture of something relevant to the lesson at hand, and then if there is time left over, tell them they can write about it! Afterwards, discuss their experiences with them, comparing it to the usual pattern, where they are asked to write something, and then if there is time left over, they can draw a picture of it. Pay attention to the musical intonation of different people as they speak during the day (including media sources). Are there people who seem to have more music in their voices than others? Notice the same thing in the various texts that you read in the course of a day. Consult with the musical specialist at your school or school district offices regarding how he/she uses music in conjunction with words. Talk about ways in which literacy and music activities may be further integrated in school programs. Look into the Orff-Schulwerk music education program and explore how it integrates music and rhythm with words and text. Listen to several different musical genres that bring together music and words (opera, programme music, jingles etc.) and discuss their educational function and potential use in your school programs. Expose kids who have difficulty reading and writing to a wide range of music-linked-with-words resources (as above). Notice if this exposure improves their literacy abilities. Investigate the impact of Noam Chomsky's transformational grammar on education over the past fifty years. What is its current status in terms of being used in school programs around the country? Investigate in the OED the etymologies of this week's vocabulary words and explore with your students the logic and illogic of their evolving spellings and meanings over the years. Create a decision tree diagram showing the sequence of questions a good reader might typically ask (explicitly or implicitly) when encountering a text for the first time (to make this more focused, choose a specific reader encountering a specific text). Explore what reading research says about the best strategies to use to improve word-attack skills and then determine how many of these strategies draw upon logical problem-solving abilities. What do studies in language and early childhood development tell us about how children employ logical processes in learning to speak? Research what is known about the right hemisphere's role in the reading and writing process. Pay attention to the nonverbal sounds that kids and adults make when experiencing different emotional states (like "bleeech!"). Make a list of such sounds and see how many correspond in some way to the 44 phonemes of the English language (or combinations of them). Reflect on your own earliest experiences of literacy in childhood (both at home and school) and the emotional content of those experiences. Action research: institute a regular "writing about how I'm feeling right now" period in your classroom or school (nongraded, optional sharing, 5–10 minutes or more). Observe whether having this regular writing experience results in a decline in problem behavior over a specific period of time (for example, three months) or an improvement in writing ability. Action research: teach students Rico's clustering technique and note whether improvements take place in writing as a result. It is claimed by many in the reading field that there are 44 phonemes in the English language. To what extent is this number an arbitrary one created within a specific social context (given the fact that people from different regions of the English-speaking world use widely varying sounds to designate the same letter or letter combination)? If this is the case, what particular social group do you think has been responsible for creating this list of 44 phonemes? Where do they stand in the social hierarchy of all speakers of English? What region or regions of the English-speaking world do they live in? Create a forum on children's books that have been banned by special interest groups, and discuss the issue of reading as a socially regulated act. Discuss the way in which words take on new meanings as their relationship to the underlying social milieu changes (for example, the word "hit" in relation to popular music, mob violence, or sexual harassment). Observe the ways in which students in your classroom or school use literacy to further their own social aims quite apart from the requirements of the curriculum (passing notes, creating campaign posters, etc.). Read Paulo Freire's Pedagogy of the Oppressed (or another work of his) and discuss the relevance of Freire's work to your own community and its literacy needs. If you were stranded on a desert island with four or five other people and wanted to share your oral traditions with your new community, what would you have to offer? Survey the variety of oral forms that you might draw upon (poems you know, stories, legends, jokes, etc.). Compare your own oral repertoire with what your parents or grandparents might have been able to share under similar circumstances. Listen to the speech of young children at play and compare it to your own inner speech. What are the similarities and differences? Then, reflect on your inner speech and its relation to your writing processes. Are there important connections“do you draw upon the words you hear in your head in your writing? In light of the above, how valid is it to say that there exists a direct connection between the talk of children at play and the ability to write later on in life? Examine a variety of texts from various print media (novels, comic books, newspapers, textbooks etc.) and notice which samples retain the closest links to oral speech. Which are the furthest from oral speech? Does the fact that a text is closer to or further away from oral speech affect its readability, its comprehensibility, or its ability to be enjoyed? Do an experiment as a teacher where everything you and your students say in classroom over the course of a period of time (e.g., fifteen minutes, one hour, a day) is simultaneously made available in print form (e.g., through a transcriber using a computer, an LCD computer projector, and a screen). Discuss with your class the experience of bringing speech and text together in this way. Replace "Sustained Silent Reading" at your school with "Sustained Out-Loud Reading" as an experiment for one or more sessions and discuss the results with your students. Go out with your class to a natural setting and collect sounds of nature as words. Then use these words in creative writing activities back in class. Keep a collection of these words to draw upon in a special Word Terrarium (or Worderium). Discuss how educators' (and parents') insistence on teaching students the names of everything (colors, directions, animals, plants, etc.) may serve to distance them from direct perceptual experience of the natural world. Is there a trade-off between losing touch with the experiential richness of nature and gaining the ability to describe it? Do action research where you compare the writing samples of students under two conditions: writing inside the classroom and writing out in a natural setting. What major differences do you see in the resulting writing in terms of originality and creativity? Think broadly about how literacy has been used to improve or destroy the earth's natural resources. What are the implications of this for using literacy in your classroom or school as a positive force for environmental change? The Multiple Intelligences of Reading and Writing: Making the Words Come Alive was written by Thomas Armstrong. This 153-page, 6"x 9" book (Stock #102280; ISBN 0-87120-718-4) is available from ASCD for $18.95 (ASCD member) and $22.95 (nonmember). Copyright 2003 by ASCD. To order a copy, call ASCD at 1-800-933-2723 (in Virginia 1-703-578-9600) and press 2 for the Service Center. Or buy the book from ASCD's Online Store.